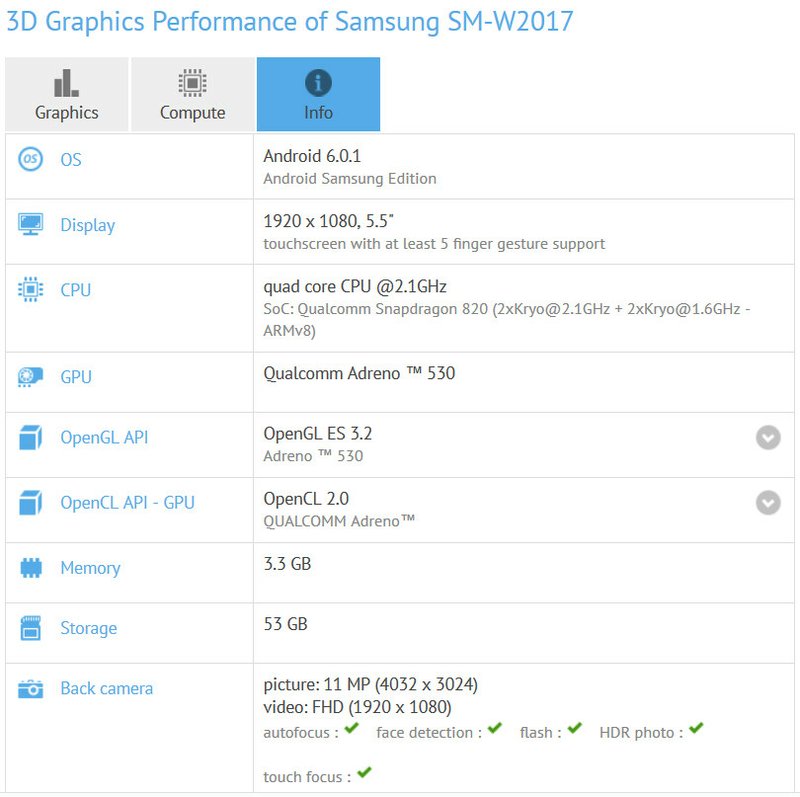 We've been showing you quite a few leaked pictures of the unannounced Samsung SM-W2017. This is a high-end Android powered clamshell for those who love the form factor, but want some of the modern features of a high-end smartphone. For example, this handset comes with a fingerprint scanner, an Always-on screen, and Quick Charge to power up the 2000mAh battery quickly. To be honest, we do have some misgivings about the GFXBench specs since the screen size shows up as 5.5-inches. The actual measurement should be 4.2-inches with a 1080 x 1920 resolution. A Snapdragon 820 chipset powers the phone with a quad-core 2.1GHz CPU and the Adreno 530 GPU. 4GB of RAM is inside, along with 64GB of flash memory. Know any other clamshell that has that much internal storage, or 4GB of RAM for that matter? The SM-W2017 offers a 12MP rear-facing camera, while the front-facing 5MP snapper handles selfies and video chats. According to GFXBench, Android 6.0.1 will be pre-installed. While we don't expect Samsung to offer the clamshell in the U.S., there is talk of a release in China next month. The rumored price tag is a remarkable $1498 USD. That price is awful, why the hell does a clamshell phone cost that much? IDC if it is a smartphone that price is robbery. That's what I said too........there's no way in hell lol. Yeah, man...maybe there's something wrong with the conversion to USD or something, because if that's the actual price, who the hell does Samsung expect to be selling any to? That could be the price actually. Its vintage/classic design could be its selling point and I know a few people who'd spend that much for it just to feel the satisfaction of slamming your phone shut when you're upset to hang up on someone. It's very popular in Asia. It's not just flip phone anymore. It's a flip smart phone lol. Asian will buy anything. They don't whined on prices.